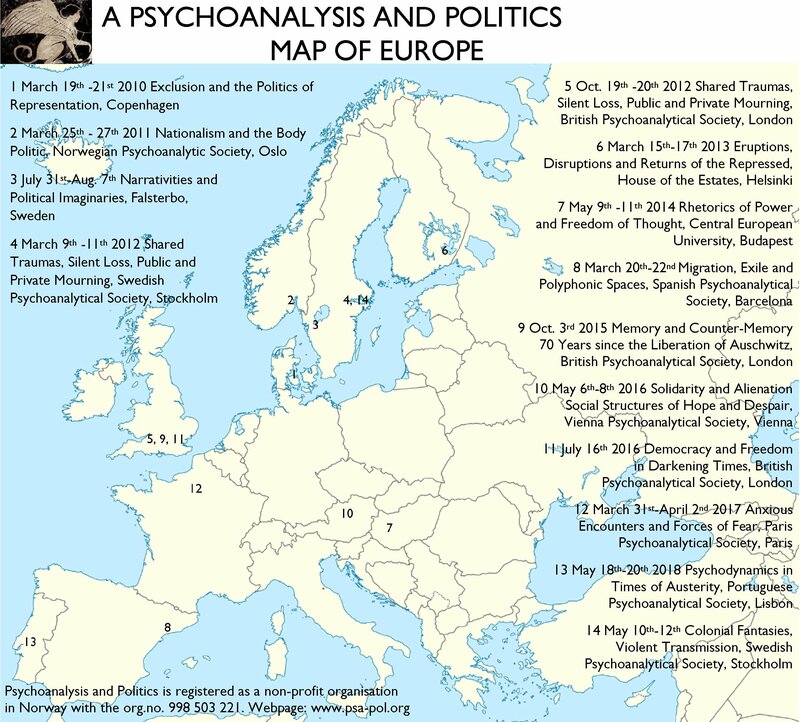 Psychoanalysis and Politics is a conference series that aims to address how crucial contemporary political issues may be fruitfully analyzed through psychoanalytic theory and vice versa – how political phenomena may reflect back on psychoanalytic thinking. The series is interdisciplinary; we invite theoretical contributions and historical, literary or clinical case studies from philosophers, sociologists, psychoanalysts, psychotherapists, group analysts, literary theorists, historians, political scientists, politicians, political activists and others. Perspectives from different psychoanalytic schools are most welcome. Everyone commits to participating in all the sessions – the ‘audience’ is not listening passively but participates in the discussion after each paper. Everyone is equal – for instance, there is no hierarchy of ‘key note speakers’ and ‘others’. There are no separate sessions running in parallel – just one unified programme. Firm boundaries are very helpful for this and feedback after each previous symposium has emphasised the value of maintaining boundaries through attendance, participation and good time-keeping. Due to the nature of the forum audio recording is not permitted – we give priority to those who are present rather than to absent others, to creating a good atmosphere for exchange. 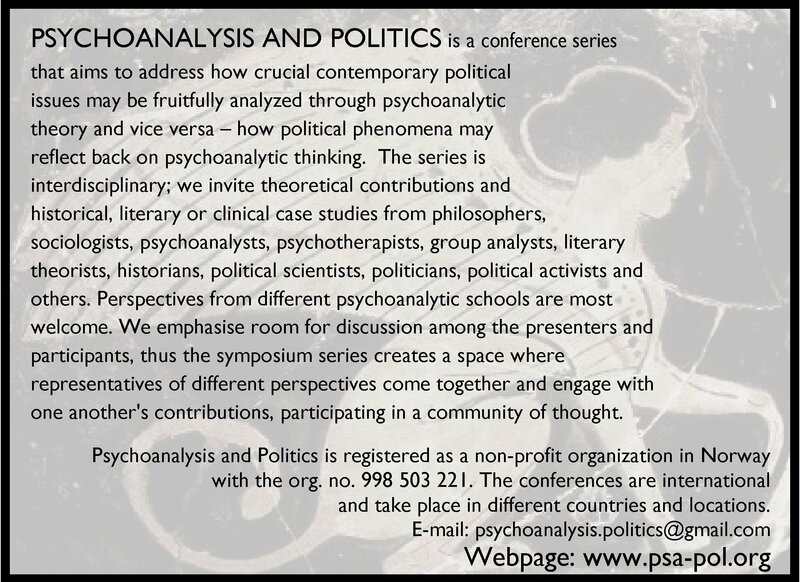 Psychoanalysis and Politics is an interdisciplinary conference series – we invite theoretical contributions and historical, literary or clinical case studies from philosophers, sociologists, psychoanalysts, psychotherapists, group analysts, literary theorists, historians and others. Perspectives from different psychoanalytic schools are most welcome. We promote discussion among the presenters and participants, for the symposium series creates a space where representatives of different perspectives come together, engage with one another’s contributions and participate in a community of thought.